Great things happen when our incredible Amish woodworkers set their minds to combining their classical skills with more modern materials and designs. 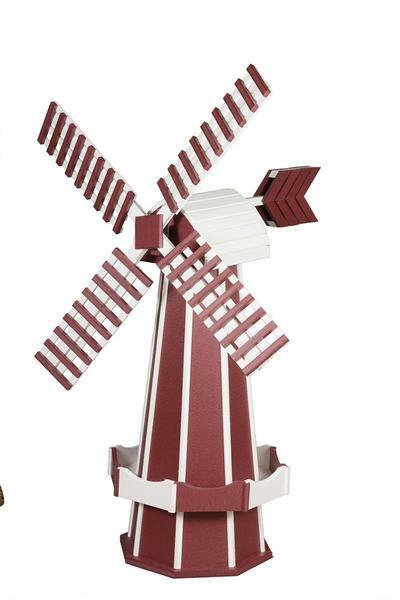 This beautiful Dutch windmill - handcrafted in your choice of colors from ultra-durable poly - is a wonderful way to bring brightness and life to your outdoor space. Its swivel top and fully-functional blades, which will move in a medium to heavy breeze, promise to bring years and years of movement and enjoyment! Every component of these beautiful windmills is made in the USA. Poly, created from recycled milk jugs and dyed in almost any color, will not rot, splinter, or come apart with changes in weather, and its versatility and durability is a big part of the reason why this particular Dutch windmill is one of our best sellers. Choose from a rainbow of shades to find your perfect windmill! If you have any questions at all, please don't hesitate to get in touch - we would love to hear from you! Overall Height To Top of Blade: 60"
Height of windmill excluding the blades: 40"
The blades on all windmills are free turning. Large Windmill includes a fin on the back. Please specify if you want a 2 tone windmill or either of the styles of Rainbow or Patriotic.